Picture a histogram where the x-axis shows means of transport to reach our lunch destination and the y-axis represents the frequency thereof. A dandruff shampoo above the rest would be the carbon-crazy car. Way down in the silver medal position would be the tree-hugging bike. Making a single solitary solo appearance would be our shoe leather. Chalking up a new entry this week would be ... the bus! Not any old bus, no sirree. Fanfare for the CassyBus, officially titled the Adastral Park railway shuttle service. Ta very much to George, our driver, for depositing us at the station, thereby getting us most of the way into town. 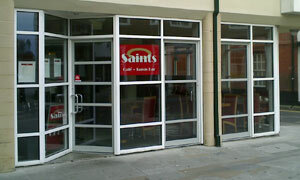 Top of St Peters Street, opposite the Sailor's Rest, look out for a modern building with plenty of glass, tables outside and a halo-based logo. There, in a nutshell, is a guide To recognizing your Saints. Ominous clouds overhead so inside we went. I believe that this place used to bill itself largely as a wine bar: after a recent makeover, though, it's emerged as a "cafe - tapas bar". Ordering drinks is the easy bit -- Fentimans equals class IMHO -- then there's the extensive array of nibbly bits to choose from. Their menu advises picking at least a couple of dishes. Not easy. After we've um-ed and ah-ed, Grenvyle arrives fresh from his own free corporation bus. As he's choosing, ours is arriving. My Spanish chicken casserole with chorizo and potatoes is a treat, and would have made a tasty light lunch on its Tom Jones. Didn't really need the hummus too; mustn't let those mushed chick peas go to waste. Nice part of town, this spot, ciabatta'd between Cardinal Park and the town centre, and an olive's throw from The Sanctuary. Feels pretty darn cosmopolitan tucking into tapas with the sun trying to break through. Good service, too. Shame that we ran out of time for what would most likely have been a top notch cup of coffee, but that's the way with public transport timetables. If it was a car -- Seat Exeo. If they were passing by -- Pablo Counago.